It has been a turbulent week for the US supermarket industry: Lidl opened its first stores in the United States and Aldi announced to expand its coverage in the US by opening another 900 stores. More notably, and you probably did not miss it last weekend: Amazon is making its largest ever acquisition by paying $13.7 billion for Whole Foods Market and is thereby entering the supermarket business in the United States. Investors were surprised by this takeover and reacted by selling off shares in competitors as Walmart and Tesco. In the Netherlands, Ahold-Delhaize lost almost 10% of its value last Friday and another 2% on Monday. Are investors right to fear Amazons entrance to this market, or do they overreact? And what consequences could this takeover have for the industry? The reasons for the acquisition of Whole Foods, a luxury supermarket chain focused on biological products for the higher market segment, are clear: Amazon is expecting major synergies with its online business. Through these stores, Amazon will be able to sell their other products it is now selling online and the distribution and transportation capacities could be combined. This is especially the case for Amazon Fresh, an online grocery delivery service, currently having a market share of 0.8% in the US. Like Whole Foods, Amazon Fresh is focusing on healthy, fresh and local products. Another spectacular innovation is delivery by drones, which is currently being tested extensively by Amazon. Amazon has been investing in supermarket technologies for quite some time now. An example is Amazon Go, a supermarket which was opened in December 2016. This store is equipped with a system of cameras and sensors registering every product customers put in their shopping bags. Customers can then simply walk out the store without having to pay at a cash register, the amount due will be credited from their Amazon account automatically. Another spectacular innovation is delivery by drones, which is currently being tested extensively by Amazon. At first glance, Amazon forms a major threat for the traditional retail chains. Firstly, Amazon has very deep pockets. This means they could afford large investments in Whole Foods and Amazon could suffer years of possible operating losses for their new supermarket branch without getting in any real troubles. Moreover, with such investment power, Amazon could expand their market share by simply taking over other competitors as well. Amazon CEO Jeff Bezos has always been following his strategy of market share over profit margins, making new acquisitions seemingly not unreasonable. 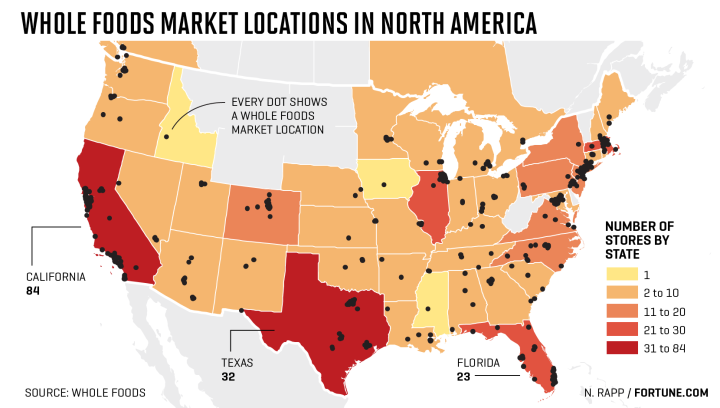 As of now, Whole Foods Market only has 438 stores in the US (and 22 outside the US) which are, as depicted in Figure 1, quite dispersed over the country. 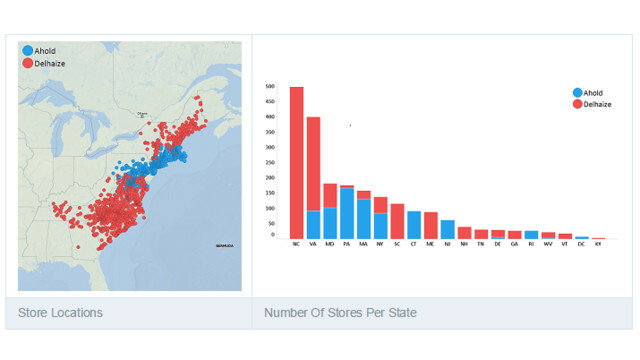 In comparison, Ahold-Delhaize has 1990 stores which are all concentrated in the Eastern States (Figure 2). Walmart operates more than 5.000 stores countrywide. If Amazon really was to benefit from its renowned transportation excellence in the supermarket business, it would need more stores throughout the country, or more concentration within certain urban regions. By only possessing Whole Foods, Amazon barely is a threat to the other established retailers. But considering the aforementioned investment power and strategy of Amazon, it would be naïve to think Amazon will stop there. In the short term however, Amazons acquisition of Whole Foods seems not a real threat to the other retailers. Amazon first has to learn in this new industry with stores of bricks and mortar, since customers still value doing groceries in the old fashioned way with only limited technological advancements. As for Ahold-Delhaize in the coming years, it will still profit from the synergies of the recent merger between Ahold and Delhaize and it has over a thousand stores more than Whole Foods. Furthermore, unlike many other US retail chains, Ahold-Delhaize has experience in facing competition from discounters Lidl and Aldi which are trying to gain market share as well. Regarding the new way of doing groceries, Ahold-Delhaize currently has the country’s leading online grocer, Peapod, and it is learning from the online business through bol.com. Because of the characteristics as described above, Ahold-Delhaize unwillingly has become a very interesting prey for Amazon. With almost 2.000 stores concentrated in the densely populated East covering over 100 million US citizens, Ahold-Delhaize seems to be the ideal next target for Amazon. Also Kroger, America’s number 2 in the retail chain market, is supposedly interested in Ahold-Delhaize. These two combined are nearly as big as US market leader Walmart in terms of revenue. Both Amazon as Kroger are probably not interested in Ahold-Delhaize’s stores in Europe, possibly leading to a splitting between the US-division and the non-US divisions. Moreover, Ahold’s old protection construction enabling Ahold-Delhaize to acquire preferred shares in case of a hostile takeover, will be terminated in two years, making it way easier for investors to acquire the firm. Ahold-Delhaize unwillingly has become a very interesting prey for Amazon. Amazon already managed to disrupt the US supermarket industry by acquiring a relatively small retail chain. For the competitors it will be a game of ‘eat or be eaten’ for the coming years. Acquisitions and major investments in distribution, store technologies and online shopping have to be made in an attempt for survival. Will Amazon live up to analysts’ expectations? And will Ahold-Delhaize become the next renowned Dutch company to encounter takeover attempts from abroad? The future will tell. GDPR Compliance, a burden or a blessing? The US Craft Beer Revolution: Is it nearing its End?